This radar image of asteroid 2005 YU55 was obtained on Nov. 7, 2011, at 11:45 a.m. PST (2:45 p.m. EST/1945 UTC), when the space rock was at 3.6 lunar distances, which is about 860,000 miles, or 1.38 million kilometers, from Earth. An asteroid the size of a city block will zoom by Earth inside the orbit of the moon today (Nov. 8), but it poses no danger of smashing into our planet, scientists say. The asteroid 2005 YU55, which is about 1,300 feet (400 meters) across, will make its closest approach to Earth at 6:28 p.m. EST (2328 GMT) today. At that point, the space rock will be traveling at about 29,000 mph and be about 201,700 miles (324,600 kilometers) from Earth — closer than the moon, which orbits 238,864 miles (384,499 km) from us on average. The flyby will mark the closest such a big space rock has come to Earth since 1976. But there's no need to scurry down to the basement bunker to await an asteroid impact, researchers say. This sky chart shows the motion of asteroid 2005 YU55 as it zooms by Earth on the evening of Nov. 8, 2011. Researchers are excited about 2005 YU55's close approach, because it gives them a chance to study the space rock as never before. The asteroid was discovered in 2005 by astronomer Robert McMillan of the University of Arizona's Lunar and Planetary Laboratory. "When you look through a telescope, asteroids don't look any different from stars," McMillan said in a statement. "The only difference is that they're moving, and to detect that motion we have to take a series of images. Usually we take three images spaced 20 or 30 minutes apart." 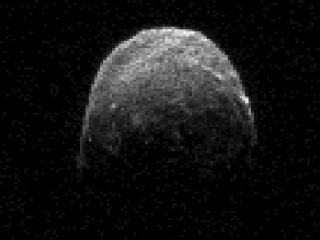 Radar images of the asteroid were taken when it made a previous flyby of Earth in April 2010 (it makes one trip around the sun every 15 months), but this approach will be much closer, so the views will be much better. Scientists have already begun taking the space rock's measure using a variety of instruments, including the huge Arecibo radio telescope in Puerto Rico and NASA's 230-foot (70-m) Goldstone radar antenna in the California desert. The Goldstone telescope has new imaging capabilities that should shed particular light on 2005 YU55, Benner said. "It shows us how big it is, it can show us features on the asteroid, it can tell us information about the asteroid's rotation period," he said in the video. "We should be able to tell much better with these new observations that we're going to do." Even those of us without access to the world's biggest radio telescopes still have a chance to spot 2005 YU55 as it zips past Earth. The asteroid will be brightest in the sky a few hours after its closest approach and should be visible with decent equipment under clear, dark skies, experts say. "You should be able to spot the asteroid with your telescope if it has an aperture of at least 6 to 8 inches," Alan MacRobert of Sky & Telescope magazine said in a statement. 2005 YU55 will move quickly, covering about 70 degrees of sky in just 10 hours or so, according to Sky & Telescope. (Your clenched fist held at arm's length measures about 10 degrees.) It will also be relatively dim, so skywatchers will probably need some help to find the space rock. But help is out there. The asteroid's coordinates at any given time can be looked up at JPL's Solar System Dynamics website, which is found here: http://ssd.jpl.nasa.gov/. Note: If you snap a photo of asteroid 2005 YU55 during its Nov. 8 flyby of Earth and would like to share it with SPACE.com for a possible story or photo gallery, send the image and your observing comments to SPACE.com senior writer Mike Wall at mwall@space.com.